This is an update to my post late Saturday night after the Rockets lost to the Denver Nuggets at Toyota Center, 107-94. I have updated my post below with my analysis of quarters 2 through 4. I know there are tons of other Web sites that will go into the details of this game, so I’ll spare you the details here. You can go to those sites to checkout what they’re saying about yet another Rockets’ collapse late in a game. From a Yao standpoint, he looked okay offensively, scoring 14 points on 6-of-10 shooting, and had 6 boards. For this game I’ve decided to go “old school” on you and do a “Detailed Yao Analysis” like I did when I first started this site 8 years ago. Through my “DYA,” you can read what Yao did (and didn’t do) in the game without having to watch the whole thing. Here’s my breakdowns of quarters 2 through 4 involving Yao and the team. 10:32 – Yao is still out of the game, but the Rockets are running with Aaron Brooks throwing from the 3-point line an alley-oop to Courtney Lee for a two-handed dunk that gets the whole crowd and bench up! Rockets lead 31-27. 9:36 – The Rockets run a fast break again, this time with Lee throwing an under-handed scoop pass to Chase Budinger who throws it down at the rim! 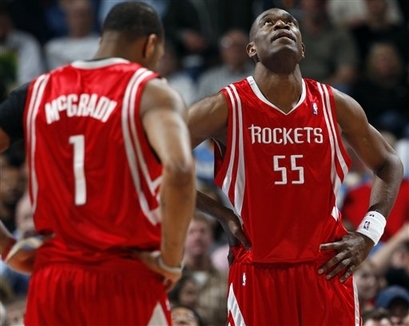 I haven’t seen this many alley-oops on a Rockets’ team since Steve Francis, Cuttino Mobley and Kelvin Cato were together! Rockets lead 33-27. 7:00 – Yao checks back into the game. The Rockets lead 35-31. 6:39 – Yao gets the ball on the right block against Nene, then immediately jumps and shoots a right-handed jump hook, which misses. 5:48 – Just like at the 9:43 mark in the 1st quarter, Yao gets the ball on the left block against Nene, dribbles 2-3 times, turns toward the basket, elevates and shoots a fallaway jumper – and it goes in! 5:04 – Yao gets the ball a couple feet outside of the lane, about ready to post-up Nene. This time, though, the Nuggets bring a guard into the lane to potentially double-team Yao if he spins into the lane like he did at the 5:48 mark above. But even with two guys, they still wouldn’t be able to stop him. For some reason, Yao decides to mix it up and spins baseline on Nene, but Yao mishandles the ball and dribbles it out of bounds. Yao is furious at himself for his mistake. 3:34 – The Nuggets have a 3-on-2 fast break, and Yao is in the lane with very low odds of being able to defend against 3 Nuggets streaking his way. Shelden Williams gets the ball on a dead run just a couple of steps away from the rim and goes up for a slam, AND YAO IS ABLE TO BLOCK IT AS HE WAS ABOUT TO THROW IT DOWN! The crowd goes nuts that we have a guy who can block a shot at the rim again! 2:37 – Yao checks out of the game as Kyle Lowry prepares to shoot free throws. Houston leads 43-42. At halftime, the Rockets lead 51-48. It could have been 51-45, but Nene hit a fluke 3-pointer at the halftime buzzer. In 12 minutes and 45 seconds, Yao has 8 points on 4-of-6 shooting, and 5 rebounds. Kevin Martin has 14 points on 6-of-9 shots, and Luis Scola has 10 points on 3-of-5 FG attempts. 3rd Quarter – Yao is on the bench as Brad Miller starts the 2nd half at center. 7:33 – Yao checks into the game for Miller. The Rockets lead 60-55. 6:03 – Yao does a good job by backing up as Carmelo Anthony drives to the lane, and manages to block Melo’s shot! The ball comes down, Nene puts up a wild shot that misses, and then Scola is fouled on a loose ball foul. That was Yao’s second block of the game, and wouldn’t have happened last year with no shot blocker in there! 5:39 – Yao posts up Nene on the left block, then passes to Kevin Martin behind the 3-point line. Martin shakes off his defender, gets a little closer to Yao, who is still in the post, and bounces a nice pass back to Yao. Yao then quickly turns to his right to face up, quickly elevates, puts up a shot that hits the rim, rattles around, and drops in! Nice touch from Yao! Houston leads 65-58 and Yao is 5-for-7 from the field with 10 points. 4:51 – With the shot clock down to 3 seconds, K-Mart has the ball behind the 3-point line and has a perfect opportunity to bounce another pass to Yao again, who has good position on Nene in a post-up on the right block. But Martin blows off that opportunity, doesn’t feed his big man, and jacks up a 3-pointer that misses badly. 4:43 – Fortunately, Kyle Lowry grabs Martin’s missed shot, brings it out, passes it back to Martin who is at the top of the 3-point line, AND MARTIN REDEEMS HIMSELF BY WHIPPING A ONE-HANDED PASS TO YAO WHO HAS GREAT POSITION IN THE LANE ON A SMALLER MAN (Al Harrington). YAO GOES UP IMMEDIATELY AND SHOOTS A RIGHT-HANDED HOOK SHOT THAT RATTLES AROUND THE RIM AND FALLS THROUGH AGAIN! THAT’S THE WAY TO DO IT, MARTIN! REWARD YOUR BIG MAN FOR WORKING HARD TO GET GOOD POSITION! 3:46 – Like the play directly above, K-Mart throws a pass from the top of the 3-point circle down to Yao who has great position down low in the paint. Yao goes up and shoots a right-handed hook shot, but he seems to rush it, and it falls short. 2:38 – Yao gets the ball on the left block, guarded by Nene again. Yao dribbles a couple of times, is double-teamed, and is fouled on the shot. 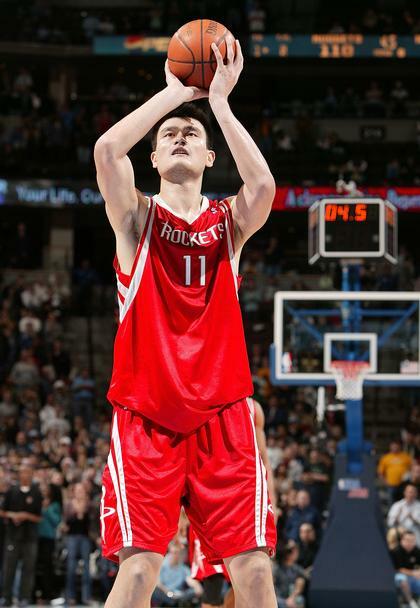 Yao makes both free throws, and the Rockets lead 69-65. He has 14 points now. 1:25 – Yao checks out of the game. He has played19 minutes so frar. The Rockets lead 69-67. 0:00 – At the end of the 3rd quarter, the Nuggets lead 72-69. Houston hasn’t scored in 2 ½ minutes. Denver ended the quarter on a 7-0 run to take the lead. 9:21 – The Nuggets have gone on an 11-0 run to take an 85-76 lead. 7:19 – Yao is still out of the game. Chuck Hayes has been fouled two possessions in a row, and he makes 2-of-4 free throws. Nuggets lead 88-82. 6:29 – The Rockets fast break and Scola scores on a layup. 88-84 Denver. 6:05 – Shelden Williams is called for a loose ball foul and a technical for “disrespect.” K-Mart hits a technical. 88-85. 5:56 – K-Mart is fouled on a layup attempt, hits two free throws, and the Rockets only trail 88-87. 4:33 – Yao checks into the game. Denver leads 90-89. Billups proceeds to hit a dagger of a 3-pointer over Aaron Brooks. 93-89. 4:10 – Martin shoots up a low-percentage 3-pointer that misses. 3:56 – Shane Battier tries to help out Brooks by double-teaming Billups, but he’s late in sliding over and is called for a block. Billups gotes to the line and hits both free throws. 95-89 Denver. 3:40 – Yao gets the ball in the post. He’s double-teamed, but dribbles once, AND IT’S STOLEN AWAY LEADING TO A FAST BREAK THE OTHER WAY. DENVER SCORES. 97-89, Nuggets. 3:15 – K-Mart misses a runner from the baseline. Denver gains possession. 2:46 – Scola misses an open jumper. 2:29 – Carmelo grabs a missed shot and lays it in. Yao was blocking out his man so that Scola, who was in front of the rim, could grab the rebound. But Melo slid in between Yao and Scola to get the board. 99-89 Denver. That just about does it. 1:03 – With the score 103-94, the game is practically over, the stands are just about empty, and they just have to play this one out. 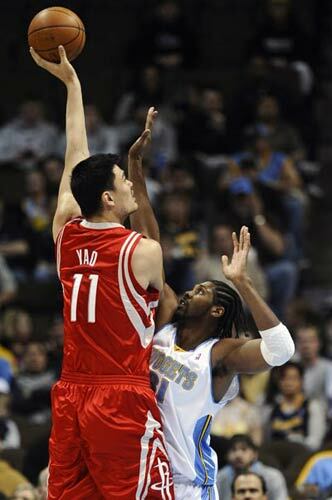 Yao gets the ball in his usual position – on the left block against Nene. He fires a turnaround jumper and it misses badly. It’s hard to believe the Rockets pulled out a victory in Denver given the things that had been going against them. It was the second night of a back-to-back, they were playing in the thin air of the Mile High City, and they couldn’t hit their free throws, finishing a pathetic 20-of-35 from the line. Yao had only scored 2 points on 1-of-6 shooting by halftime, they let a big lead slip away, and Yao fouled himself out of the game with 2:33 remaining on a silly foul at half-court trying to steal the ball from Chauncey Billups. but he would finish with 15 points in a big win in Denver. But the Rockets came through thanks to a huge 3-pointer by Shane Battier in the corner with 1:02 remaining to give them a 92-85 lead. Throw in a few free throws by Aaron Brooks and Kyle Lowry after that, and Houston got one of their most surprising road wins of the season. Although I knew the Rockets were going to be much improved after they put a lot of their past drama behind them during the All-Star break, even I’m surprised they pulled this game out. Houston started off slowly by shooting only 33% from the floor. But in the second quarter, they finally got it in gear by going on a 16-4 run to take a 34-32 lead, and extended it to 45-40 by halftime. They had only shot 38% by that time. Ron Artest and Brooks had scored 9 points each, and Carl Landry had 8. But those were the only highlights offensively, given Houston made only 7-of-15 free throws. They offset their lowlights by holding the Nuggets to 34.1% shooting, with Nene Hilario missing 8-of-11 shots, most at point-blank range. The Rockets started rolling in the 3rd quarter as they opened up a 19-point lead after Artest hit a 3-pointer to cap a 15-0 run. But you knew the rest of the way wasn’t going to be easy since the Nuggets are still explosive, even after losing 7 of their last 10 games, and have come back 10 times this season when trailing by 10 or more points. They would do just that, but Yao came back into the game in the fourth quarter, hit a jump hook and a couple of free throws, Battier would hit that 3-pointer, Chuck Hayes would make a huge play in the final minute by sacrificing his body to dive and save a ball that was headed out-of-bounds, and the Rockets would hit 5-of-6 free throws down the stretch to seal it. Although he fouled out and only played about 27 minutes, Yao hit 4-of-5 shots in the second half to score 15 points and grab 7 boards. Shockingly, Luis Scola only scored 4 points, but he racked up 15 boards. Artest was money again scoring 22 points, including 4-of-9 three-pointers. And Brooks continues to answer the call in big games, hitting 7-of-13 shots to score 19. Give credit to the front office and the coaching staff for having faith in Brooks as a starter in this league when no one really thought the same. But it was their defense that was the key to this win, having held Denver to 38.1% shooting overall. Since the Rockets-Nuggets game ended so early because it was a matinee on MLK Jr. Day, most of you already know what happened. So I’ll try to go “old school” on you and do some play-by-play on this huge victory the Rockets pulled off. They’ve now won their 5 of their last 6 games, defeated a Denver team that had won 9 of their last 12, and pulled within 1 game of the Nuggets in the Western Conference standings. Yao Ming was outstanding with 31 points on 13-of-19 shooting. Over his past 2 games, he’s averaging 28.5 ppg and is 25-for-31 from the field. At this rate, Yao is in serious contention for Player of the Week Honors. He’s leading this team and seems to be back to the level he was playing last year before his bid to win league MVP was cut short because of his foot injury. 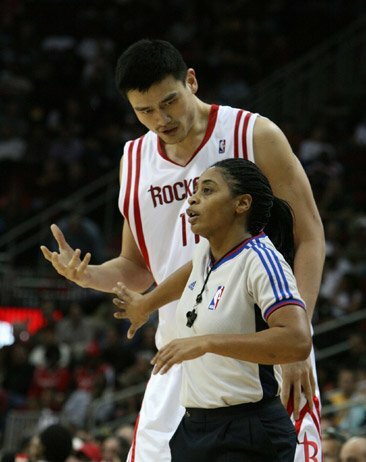 The refs had questionable calls against Yao most of the afternoon. Von Wafer jetted fast down the court and scored on a layup to make it 25-24, Houston. Then a few minutes later, Von took an offensive rebound the length of the court coast-to-coast, took it strong to the hole, scored, and was fouled! I loved his reaction both times – a little leg kick combined with a fist pump. Von finished the quarter with 9 points on 3-of-7 shooting. Wafer is kind of like Avery Johnson – a journeyman who finally landed with a team and became a force. You don’t see that very often. Hopefully the Rockets will keep Von as long as the Spurs kept Avery. Rafer Alston hit his first three 3-pointers and was 5-for-6 in the first quarter for 13 points, including a sweet fake in the lane, then hoisting up a teardrop for the score. At about the 1 minute mark, Yao grabbed an offensive rebound under the basket and threw down a one-handed reverse dunk over Chris Andersen. Yao finished the quarter with 8 points on 4-of-7 shooting. I’m at work today but followed the progress of the Rockets’ MLK game this afternoon against Denver. I’m glad I recorded the game on my home DVR so I can report on it later tonight, because this game sounded like a classic! Houston won 115-113, with lots of exciting moments, including Yao Ming grabbing a game-saving steal at the end of the game. 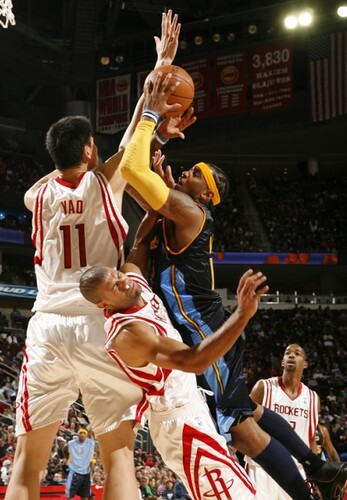 Yao also dominated in the fourth quarter with 13 points, and finished with a game-high 31 points on 13-of-19 shooting. Yao is really stepping it up in Tracy McGrady and Ron Artest‘s absence. This game was huge because with the win, the Rockets, now 26-16, pulled within 1 game of the Nuggets in the Western Conference standings. I can’t wait to watch this game when I get home tonight so I can provide more details. Stay tuned! Losing 111-94 Sunday night in Denver, it’s unbelievable how badly the Rockets stunk in such a big game. With San Antonio’s loss against the Lakers Sunday afternoon, did anyone tell the Rockets they were only 1 game behind the Lakers, and with a win could be only ½ game behind LA for first in the West? It certainly didn’t look like it. They laid an egg in one of their biggest games of the season (at least if you consider getting the first seed in the conference a big deal, which the Rockets obviously didn’t). Their performance in such a big game reminded me of that 40-point blowout against the Dallas Mavericks in Game 7 of their playoff series 3 seasons ago. Maybe there is some legitimacy after all behind the notion that all the other Western Conference teams want to match up against the Rockets in the first round of the playoffs. This was a disgrace of a performance. If the Rockets are going to play this way in such a big game, you can just about predict what the outcome will be in a 7-game series against any other team in this year’s playoffs. Tracy McGrady takes it strong to the hole for a jam after blowing by Denver’s Eduardo Najera (not pictured) in the first quarter Sunday night. In Yao Ming’s absence, Tracy McGrady led all scorers with 22 points, 6 rebounds and 6 assists in one of his finest games of the season. The Rockets beat the Nuggets for their 15th game in a row, which ties a franchise record. Click here for more photos from the game. I am almost out of adjectives to describe how well the Rockets are playing and continuing to improve, even as they keep winning. Victorious for the 15th straight time Sunday night against a decent Denver Nugget team fighting for playoff position, you just have to savor what we’re witnessing and realize that it may be a very long time until we see something like this happen again (maybe another 14 years?). It’s one thing to SAY it, but it’s another to SEE it as represented in the standings below…note how Houston’s streak stands out from all the other Western Conference team’s streaks, as well as being ahead of Phoenix and Dallas (barely) for 5th place in the West (for now). When is the last time you saw that? Sure, the Rockets have benefited the past few weeks to have played 12 of their last 15 games against cupcakes, but they deserve it since they played such a tough schedule at the beginning of the season. A little bit of luck has been involved in scraping out victories against Seattle and Sacramento during this stretch, but you’ve got to hand it to them for beating good teams like Golden State, New Orleans and Denver. Later this month is when the schedule gets much tougher again, so savor this streak while you can. During their run, they have continued to get better with everyone raising their game, especially in the last 3 games with Yao Ming out because of his injury. [Note: Yao wasn’t at Toyota Center during the game because of the early morning surgery he’ll have on his foot Monday morning]. Yao Ming calmly shoots a second free throw that gives the Rockets a one-point lead in double-overtime against the Denver Nuggets, but the Rockets lost the game a couple of minutes later on a last second shot by Denver’s Anthony Carter. Yao was a force in the game, showing leadership, and scoring 26 points and grabbing 19 boards in 52 minutes of play. Click here for more photos from the game. I wasn’t too disappointed in the double-overtime loss to Denver last night. I have been saying for a few days now that the objective for the Rockets is to get the 8th seed in the playoffs. Forget about getting home court advantage. The Western Conference is so tough anyway, there isn’t much difference between an 8th-seeded team and a 3rd- or 2nd-seeded one. It would have been great if the Rockets were at the top of the conference, but since that’s not going to happen this season, the important thing is for the Rockets to try to become a dangerous team that no one wants to play in April and May. It was really interesting to watch the Rockets move the ball better than they have all season without Tracy McGrady in the lineup. Coincidence, or not? I think we all know the answer to that one. Yao Ming comes over defensively to help Shane Battier defend against Denver’s Carmelo Anthony taking it to the hoop Saturday night. Yao finished with 22 points on 9-of-18 shots, and grabbed 13 boards in a rare 109-81 blowout against a Nugget team that has now shot below 40% for three straight games. Click here for more photos from the game. For all of us who tuned into the Rockets game Saturday night against the Nuggets to see if they would crash-and-burn in the game’s final minutes…well, we’ll all have to wait until Monday night when the Rockets play the Clippers in LA. Having lost 6 in a row, the Rockets came out like a caged animal and opened huge 20+ point leads against a poor-shooting Nugget team. Although Denver came into the game 9-4, they had shot less than 40% their last two games, and aren’t really as good as their record indicates. They made it 3 games in a row Saturday night, making only 35.4% of their shots in a 109-81 loss to the Rockets. The core of their offense, Allen Iverson and Carmelo Anthony, made only 15-of-38 shots to score 35 of their 81 points. So it’s really hard to tell just how well the Rockets will fare once some real pressure is applied to their defense. But the Rockets will take the ‘W’ any way they can get it to get their record back to 7-7. It was clear the Rockets were going to go all out to stop their 6-game losing streak, showing lots of energy and resolve to build a lead so big that no team could really blow. It’s just too bad it took this long for a sense of urgency to set in. 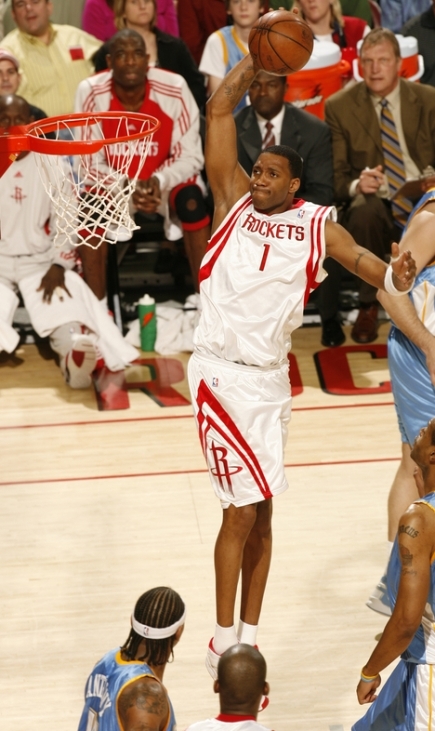 Tracy McGrady was aggressive going to the hole, and his shooting percentage reflected it, making 13-of-23 shots for 35 points. Not intentionally wanting to be a party-pooper, I still think he fell in love with too many outside shots. Everything he shot close seemed to go in, so I think that emboldened him to take four 3-pointers (he missed three) and take three other unnecessary jump shots. Yao flew back early from Denver for a doctor’s appointment in Houston that was moved up one day early, as Jonathan Feigen of the Chronicle points out. At least he’s getting used to the NBA travel regimen again. After his first practice on Thursday since his injury on December 23rd, he checked out well with the doctor. Even though the doctors haven’t cleared him to play or set a date for his return, it has to be a good sign. And when he is allowed to play, Jeff Van Gundy is going to play him right away. There’s no question about it, as JVG mentions in this piece. Meanwhile, Yao’s teammates took care of business in Denver and got payback for that crushing defeat against the Nuggets in Houston on January 20th. Although the Nuggets shot 47.4% from the field vs. Houston’s 41.8%, the Rockets built an 18-point second half lead. The key difference was that the Rockets got off 20 shots more than the Nuggets, thanks to 18 offensive rebounds for the Rockets (8 grabbed by Dikembe Mutombo) compared to only 5 offensive boards total for the Nuggets. Mutombo was a monster on the boards altogether, grabbing 22, the highest ever for a 40-year old in the NBA. The other key was Houston hitting an incredible 14-of-30 three-pointers. Shane Battier was amazing, hitting 5-of-6 treys for 15 points total. Luther Head made 5-of-9 and scored 17 points. Tracy McGrady led the team with 28 points on 11-of-30 shooting, with most of his damage coming in the first half. He also had 7 assists, and surprisingly Juwan Howard tied him with team-high honors with 7 dimes himself. Howard also made 9-of-19 shots for 18 points. Now the tough part is that the Rockets have to come back to Houston and play San Antonio on Saturday night. The Rockets have lost 3 of 4 games in Houston on the second night of a back-to-back, and San Antonio is starting to roll, having won 7 straight games. They are also 4 games ahead of the Rockets for home-court advantage in the playoffs with both teams having 24 games left to play, so this will be a big game toward determining who gets home court. Well, the Rockets blew a golden chance to get a fairly easy one against the Nuggets without their MVP candidate Saturday night in Houston. This game really makes me mad. The Rockets had an 8-point lead against the Nuggets with 2:49 remaining in the fourth quarter, and still blew it to lose in OT, 121-113. Sure, the Rockets’ defense was bad as you’ll read in this Houston Chronicle story. But at least they were ahead against an average team and were on the cusp of putting them away in the fourth quarter. With 1:23 remaining, the Rockets led 108-105, had the ball, and basically could have put the game out of reach when Rafer Alston zipped a pass to Tracy McGrady cutting to the basket for an easy reverse layup – but T-Mac blew the shot! The glaring weakness in the Rockets’ offense was Alston, who missed 13-of-18 shots (didn’t he score 29 the other day? ), took stupid shots down the stretch, and had easy passes go through his hands for turnovers (4 overall). This guy’s inconsistency is driving me nuts. And why is a point guard taking 18 shots? Meanwhile, Iverson scored 36 and only had 3 turnovers. On the bright side, the Rockets other role players played very well offensively. Bonzi Wells played superb, hitting 5-of-9 shots for 12 points. Juwan Howard was 8-of-13 with 21 points. Shane Battier was solid with 14 points on 5-of-9 shooting. And Luther Head was 6-of-14 with 15 points. Meanwhile, T-Mac was just so-so, making 9-of-25 shots for 24 points. On a night when he wasn’t shooting well, at least he was a playmaker with 10 assists. That’s what is so gut-wrenching about this game. Except for Alston, most of the guys shot pretty well and the Rockets had this one in the bag. They even had a 13-point with 10:30 remaining. But bad defense (Nuggets hit 15-of-29 three-pointers) and poor shooting suddenly has put Houston one game behind the Lakers in the 6th playoff spot in the Western Conference playoff seeds. This game reminded me of those games last year when they couldn’t close out close games. Now the Rockets have lost three in a row, and they play the Spurs in San Antonio on Wednesday. You know the Spurs will be looking for payback when the Rockets beat them pretty bad last time in their own gym. Games like this one against Denver (19-17 record coming in) should be automatic W’s. You are currently browsing the archives for the vs. Denver category.